Marshall (USC's No. 8) defends Stanford's receiver. 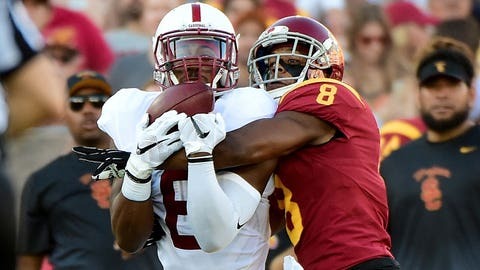 USC freshman cornerback Iman “Biggie” Marshall said he wants to be legendary. He's also become a constant site working out after Trojans' practice. According to OC Register, Marshall often stays to work on his footwork or hand placement or whatever else he feels needs improvement in his game. While no one tells him to stay, the former five-star recruit has impressed USC's coaching staff.